The desktop version of the Opera web browser makes it really simple to save web pages offline. You might want to do this to keep an offline copy of the web page on your hard drive, or to go through the page's source code in your favorite text editor. No matter the reason, downloading a page in Opera is really simple. You can do so through the program's menu or by hitting some keys on your keyboard. Before we start, know that there are two different kinds of pages you can save. If you save the entire page, including its images and files, you can access all of those things offline even if the live page changes or goes down. This is called Webpage, Complete, as you'll see in the steps below. The other kind of page you can save is just the HTML file, called Webpage, HTML Only, which will give you just the text on the page but the images and other links still point to online resources. If those online files are removed or the website goes down, the HTML file you downloaded can't render those files anymore. One reason you might choose to download only the HTML file is if you don't need all of those files to download as well. Maybe you only want the page's source code or you're confident that the website won't change during the time that you'll be using the file. The quickest way to do this is to hit the Ctrl+S keyboard shortcut (Shift+Command+S on macOS) to open the Save As dialog box. Choose the type of web page to download and then hit Save to download it. Click the red menu button at the top left corner of the browser. Go into the Page > Save as... menu item. Choose to save the web page as Webpage, Complete to download the page and all of its images and files, or select Webpage, HTML Only to only download the HTML file. 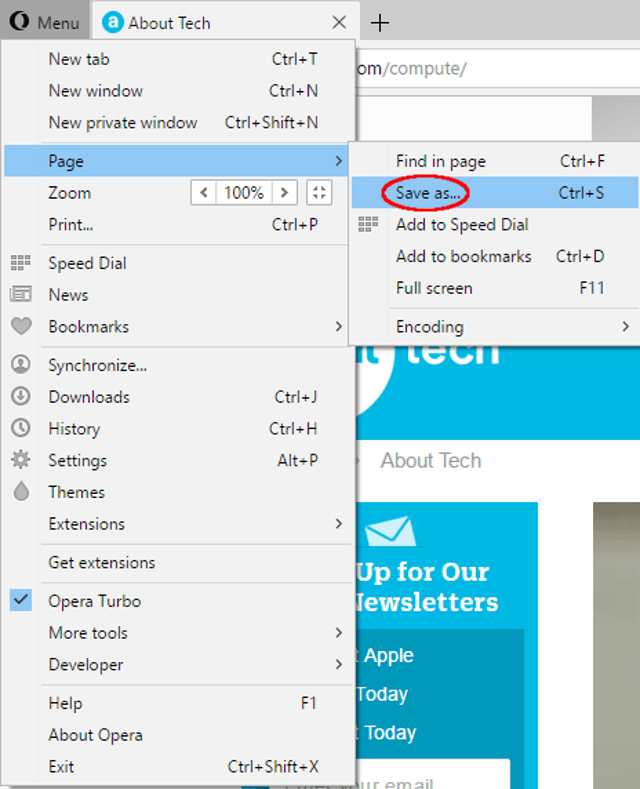 Another menu you can access to save a web page in Opera is the right-click menu. Just right-click the blank area on any page you want to download, and then choose Save as... to get to the same menu described in Step 3 above.